This kitchen scale took me only a few minutes to make. My invention uses a few commonly available materials and tools. It is free and pretty accurate. It is also durable and easy to use. To improve the accuracy, I have provided a few guidelines to help you to understand the usage and find the optimal accuracy for your own situation. Since all the parts used in making it can be used or shared with your other projects (the paint stick can be used as a ruler), it does not require any space to store it. I hope this video can inspire you to invent useful devices with things available to you. This kind of project will also nurture your kids’ creativity and future-proof their skills. If you have any tips, please leave a comment below. I will also show you how to make another very small scale that is hidden inside your shopping bag. This way you can do comparative shopping discretely. 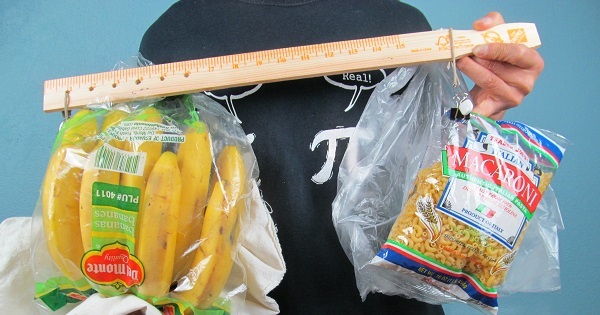 If you don’t have the time or the ability to make the first one, the rubber band scale is easier to make. But it does need more time to re-calibrate especially if you stretch it too much. This entry was posted in kitchen, life hack and tagged accurate, calibrate, free, invention, kitchen scale, paint stick, rubber band, scale, weight scale on October 8, 2018 by David Zhang.